Fruit of the carobtree. It is not mentioned in the Masoretic text of the Old Testament, though Cheyne assumes that in three passages (II Kings vi. 25, xviii. 27 = Isa. xxxvi. 12; Isa. i. 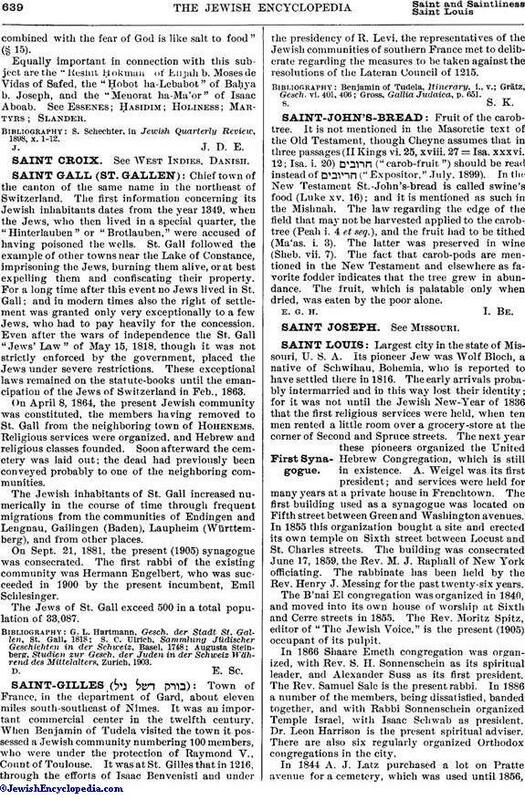 20) ("carob-fruit") should be read instead of ("Expositor," July, 1899). In the New Testament St.-John's-bread is called swine's food (Luke xv. 16); and it is mentioned as such in the Mishnah. The law regarding the edge of the field that may not be harvested applied to the carobtree (Peah i. 4 et seq. ), and the fruit had to be tithed (Ma'as. i. 3). The latter was preserved in wine (Sheb. vii. 7). The fact that carob-pods are mentioned in the New Testament and elsewhere as favorite fodder indicates that the tree grew in abundance. The fruit, which is palatable only when dried, was eaten by the poor alone.